Uber Technologies Inc goes before a U.S. judge on Wednesday to fight for the right to continue work on its self-driving car program, the latest phase in a courtroom battle over trade secrets that threatens to topple a central pillar of Uber's growth strategy. The ride-services company is contesting a lawsuit by Alphabet Inc's self-driving car unit, Waymo, which accused former Waymo engineer and current Uber executive Anthony Levandowski of taking technical secrets from Waymo and using them to help Uber's self-driving car development. If it were proven that Levandowski and Uber conspired in taking the information, that could have dire consequences for Uber, say legal and ride-hailing industry experts. Uber's $68 billion valuation is propped up in part by investors' belief it will be a dominant player in the emerging business of self-driving cars. At issue on Wednesday is Waymo's demand that U.S. District Court Judge William Alsup in San Francisco issue an injunction barring Uber from using any of the technology that Waymo said was stolen. If Alsup issues a broadly worded order against Uber, it could all but shut down Uber's self-driving car program while court proceedings continue. Alsup is not expected to rule immediately on Wednesday, but he may intimate which way he is leaning. At a hearing last month, Alsup warned Uber that it may face an injunction, saying of the evidence amassed by Waymo: "I've never seen a record this strong in 42 years." Uber Chief Executive Officer Travis Kalanick has said that autonomous vehicles, though still in their infancy, are critical to the company's long-term success and future growth. Indeed, autonomous cars promise to change the economics of the ride-hailing business. Among Uber's biggest expenses is the cost of attracting drivers, who have a high turnover rate. And Uber's ability to expand into suburban and rural markets, and areas with low vehicle ownership, and continue to offer a ride within three minutes, largely hinges on the availability of a network of self-driving vehicles. "This is central to Uber," said Arun Sundararajan, a professor at New York University and author of the book "The Sharing Economy," noting that Uber has more at stake than some of its rivals. "If Google can't launch their self-driving car for 10 years instead of five, this will be a little blip in Google's multibillion-dollar revenue. 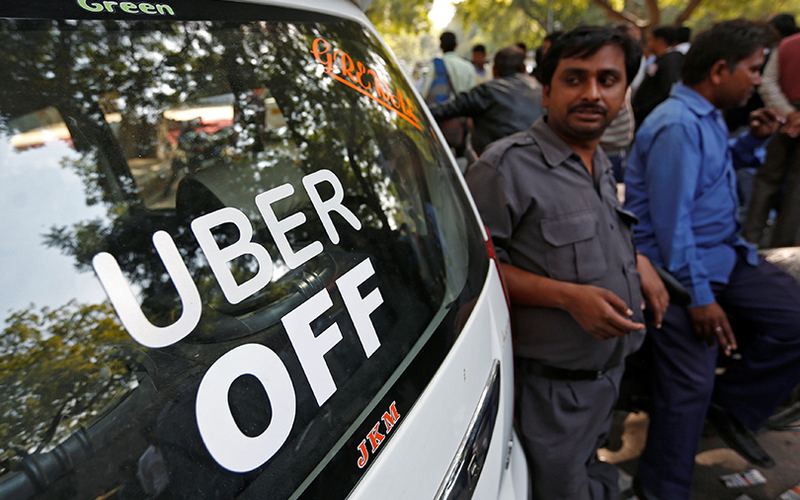 Uber is the one that really depends on it." Uber has faced a string of setbacks in recent months, including allegations of sexual harassment from a former employee and the public release of a video of Kalanick berating an Uber driver. The company, though still growing strongly, is losing hundreds of millions of dollars a quarter, according to information the company released last month. "Any big setback here would likely hit its valuation hard," said Jan Dawson, an Uber analyst with Jackdaw Research. A blanket ban on Uber's autonomous efforts "would certainly stall its efforts for a while and put it even further behind Waymo and others." Uber has self-driving tests underway in Pittsburgh, San Francisco and Arizona. It started work on the technology six years after Google began. Other industry watchers say that Uber, which has deep pockets and other value propositions such as huge swaths of traffic and rider data, could ride out a negative ruling in the Waymo case. The Waymo lawsuit, filed in February, revolves around a laser-based technology called Lidar that allows cars to "see" their surroundings and detect the location of other cars and pedestrians. Waymo said Levandowski, who until last week was head of Uber's self-driving car program, stole more than 14,000 confidential documents before leaving his job at Waymo in January 2016. He formed a self-driving truck startup, Otto, which Uber bought in August for $680 million. Uber has said Waymo's claims are false, and in a court filing called the preliminary injunction motion "a misfire." Uber has not denied Levandowski took files from Waymo, but said it never possessed any of the confidential information that Waymo accused Levandowski of stealing. Levandowski himself has invoked his constitutional right against self-incrimination because of the possibility of a future criminal probe. And last week, Levandowski said in an email to Uber employees he would stay at Uber but was stepping down from his work on Lidar. "You're left to assume the worst," said Elizabeth Rowe, an intellectual property professor at University of Florida Levin College of Law. In a deposition of Levandowski last month, attorneys for Waymo also probed Levandowski about Kalanick, whether the CEO encouraged him to take Waymo's confidential material, according to a court transcript. Levandowski invoked the Fifth Amendment. A spokesman for Uber declined to comment on the deposition.